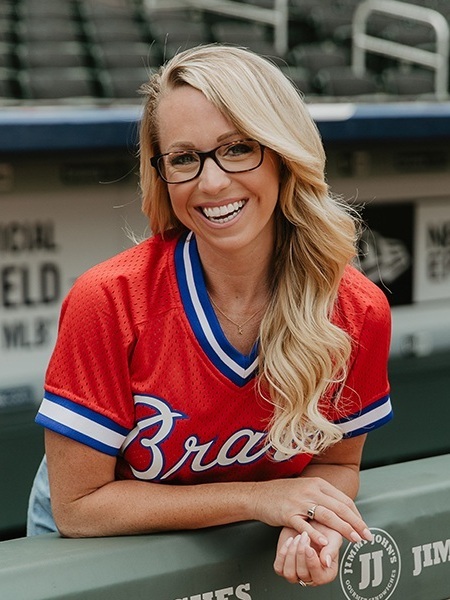 At just 26 years old, LSU grad Kelsey Wingert is making a name for herself as a reporter and host for FOX Sports South and FOX Sports Southeast in Atlanta. Wingert’s primary role is covering the Atlanta Braves as a field reporter. She works about 150 of the Braves 162 game season. You’ll also find her on the job for Atlantic Coast Conference college football games and doing in-studio cut-ins during NBA and NHL broadcasts. “I always tell people, when you apply, market size doesn’t matter, just get that first job. In order to get better you have to be on-air. And when you’re in those small markets … you get on air every single day.” Wingert wasn’t looking for a job while working at KALB-TV in Alexandria, LA, but jumped at the chance to interview for the Fox Sports position after learning it was open. A diehard sports fan, Kelsey, has been interested in sports broadcasting since middle school. Originally from Texas, she graduated from LSU in 2014 with a minor in Sports Studies and a major in Broadcast Journalism. Keep up with Kelsey’s adventures @KelsWingert on instagram. A 10 year Atlanta native, Tribble has been lip-syncing ever since he retired from his reality tv career years back and a life goal is receiving a call to be on Jimmy Kimmel’s LipSync Battle. A former Clemson football player and still an avid fan, he is involved in Buckhead Church, volunteering at Hillside Elementary, and teaching classes at The Forum Athletic Club. Tribble is a big believer in making people feel good about being themselves in their own skin. Follow the madness @tribblereese on instagram.